We are coming off of an extremely successful annual meeting and I feel fortunate to have seen and talked to so many of you. The discussions and comradely is always refreshing, much like the spring air that we are beginning to notice. We have begun an important collaboration with the Wisconsin Chapter of the American College of Emergency Physicians, which is being chaired by Drs. Michael Peterson and Tony Thrasher. I hope to bring many updates regarding this as we move forward. I wanted to share a few of my forward thoughts for the next year. A small group has formed to begin addressing burnout, as well as further development of options to electronically collaborate together. We are also entering the campaign season, which will undoubtedly result in a number of discussions. Further, I look toward meeting all of the new incoming residency classes this summer, as they are the future of Psychiatry and our society. And lastly, I cannot believe that it is already pulling up on one year since I took over this role. I want to thank all of you for the ongoing opportunity and look forward to another year of growth and development for our organization. The 2018 WPA Resident Vignette Competition took place during the Annual Conference earlier this month at The Edgewater in Madison. Now in its 6th year, the competition continues to offer outstanding presentations from Wisconsin residents, as well as thought-provoking questions and interaction among conference attendees. This year's presenters included Drs. Michelle Hume and Yelena Mironova-Chin from UW, and Drs. Amanda Liewen and Satish Shashidhara from MCW. 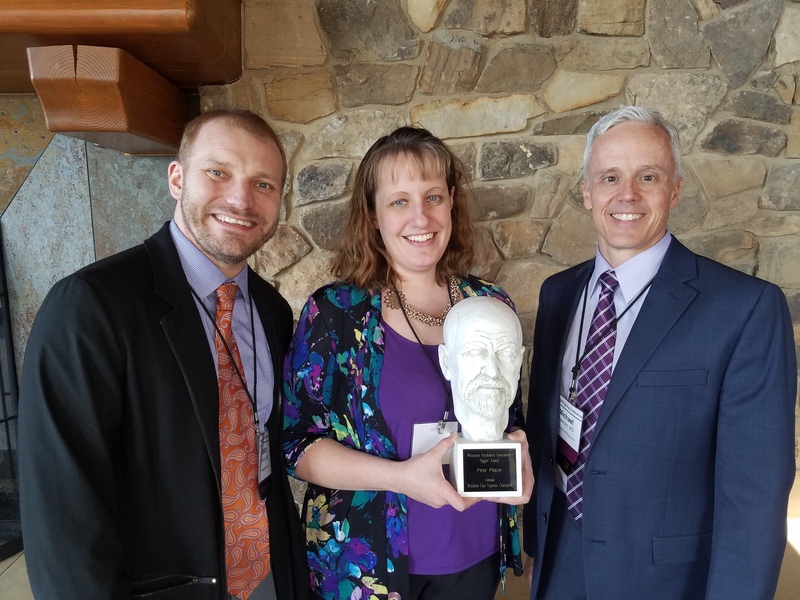 The winning clinical vignette was presented by Michelle Hume, MD, who brought the “Siggy” back to the University of Wisconsin. A special thanks to Michael Peterson, MD, PhD for moderating the competition, and to the 2018 judges, Drs. Meredith Holbrook, MJ Kramer, Jeff Marcus, and James Rutherford. Next year's competition which will take place on March 15, 2019 during the 2019 Annual Conference at The Osthoff in Elkhart Lake. The Friend of WPA Award is presented every other year to a Wisconsin legislator who has been a champion for advancing mental health care, or for efforts aimed at advocating for patients with mental illness. In selecting a recipient, the WPA Executive Council looks at candidates with a track record of authoring or voting in favor of legislation that aims to positively impact mental health issues. Representative Paul Tittle was chosen as the 2018 recipient of the Friend of WPA award for his long track record of legislative initiatives that support mental health care. 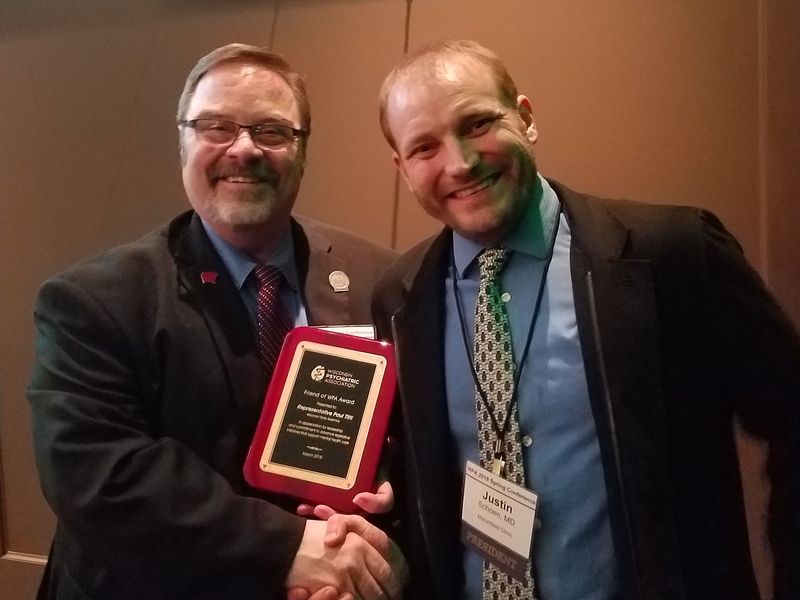 WPA President Justin Schoen presented the award to Rep. Tittle during the opening dinner at the WPA Annual Conference on March 8. Scott Walker, Governor of Wisconsin, signs proclamation declaring April 23-29, 2018 "Addiction Treatment Awareness Week" throughout the State of Wisconsin. National Addiction Treatment Week, an initiative by the American Society of Addiction Medicine (ASAM), raises awareness that addiction is a disease, evidence-based treatments are available, and recovery is possible. Read more. WPA Past President and Wisconsin Medical Society current Board Chair Jerry Halverson, MD, was in attendance earlier this month as Gov. Scott Walker signed into law a bill providing better clarity for medical personnel in difficult situations involving emergency detentions. Read more. The Senate approved a school safety proposal that did not include an increase in mental health funding despite calls from school districts, law enforcement and advocates. The proposal, which was approved by the Senate 28-4, would create an Office of School Safety under the Department of Justice and provide $100 million in grants through the office. 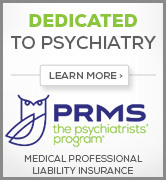 It would also require that the office incorporate trauma-informed care into its trainings. Read more. The Senate approved more than a dozen bills during its final planned floor period of the session Tuesday, sending them to Gov. Scott Walker’s desk for approval. The bills range from creating an intensive care coordination program in Medicaid, supporting efforts to fight the opioid epidemic and providing grants to increase awareness of Alzheimer’s and dementia. But the chamber didn’t take up some proposals approved by the Assembly in recent weeks. That includes bills that would define direct primary care in state law and allow small businesses to band together and self-insure their health plans. Read more. Darold Treffert, MD, psychiatrist and world-renowned expert on autism and savant syndrome, received a Lifetime Achievement Award on February 20 at the Envision Greater Fond du Lac Annual Meeting. Doctor Treffert has been studying autism and savant syndrome for over 50 years, serving as a consultant for “Rain Man,” and appearing on CNN, Today, Dateline, 60 Minutes and The Discovery Channel. He has written two awarding-winning books on savant syndrome and shared his expertise in over 50 national and international publications. 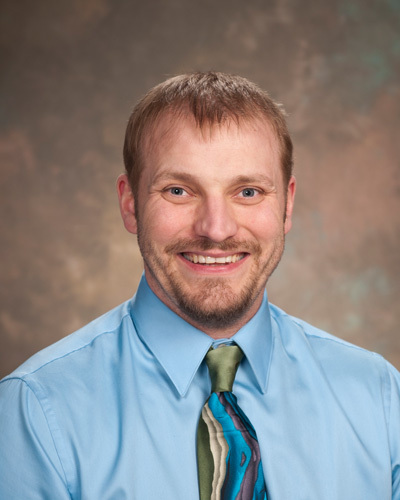 He now devotes his time to research, writing and lecturing at the Treffert Center in Fond du Lac. Read more. Save the Date! 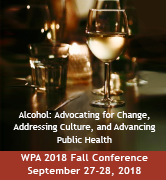 The WPA Fall Conference will take place September 27-28, 2018, and the focus is on: Alcohol: Advocating for Change, Addressing Culture, and Advancing Public Health. Online registration will open soon at www.TheWPA.org. 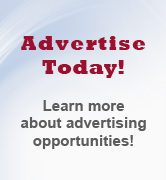 Submit your news story here for inclusion on the WPA website or in future e-newsletters.